‘Those who consecrate and purify themselves to go into the gardens, following …. abominable things—they will meet their end together,’ declares the LORD. We are suffering from a terrible theological famine these days. I refer not to the need for lofty religious speech and intellectual striving, though I am convinced that we modern believers are far too lazy when it comes to studying the Scriptures. I am speaking instead of the fact that we are languishing in immaturity, lovelessness, and lawlessness; pulled and jerked by the powers of entertainment, wealth, and various forms of idolatry, and we scarcely realize that a famine of hearing the word of the Lord is upon us. We are inundated with words about the Lord, but it is rare still for us to hear the word of the Lord. One of the obvious rotten fruits of this condition is our conspicuous inability to discern the difference between the works of God and the works of the flesh. In this regard we are nearly as ignorant as the atheist next door. We have been unwilling to ask painful questions, even if they are of the kind set forth in the Scriptures. We have thus robbed ourselves of the knowledge of God, as He is. We have lost the ability to muse and contemplate, and succumbing to what C.S. Lewis called a “post-human” state we’ve become consumers, incapable of valuing anything that doesn’t instantly gratify our souls. We shirk the truth, especially when it is difficult to consider or receive. Little do we realize that nothing is more relevant to our life upon the earth than the radically theological nature of passages such as Isaiah 66. When I say theological, I do not mean that this is the stuff of advanced intellectuals. I mean that these portions of Scripture are not meant only to fill up space in our Bibles or even to give us a chart on the last days, but chiefly to reveal the nature and character of God Himself. In that sense, they are intensely theological, for theology is simply the study of God. If we do not know the Lord as He has revealed Himself, and if we have failed to love Him as He has revealed Himself, what will change our disposition toward Him when darker days are upon us? Do we really love the God of the Scriptures, or have we been guilty of making Him after our own liking? 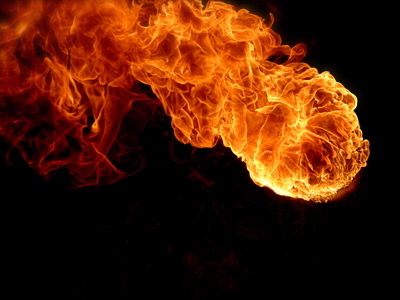 With fire, or ‘as fire’, has the same construction as Exodus 3.2, where ‘fire’ is defined as a motif of the unapproachable, deadly holiness of God (cf.Gn. 3.24; Ex.19). …. The whole of human history, from the fall to the last day, is bracketed about by the sword of holiness. In 59.17 ‘righteousness’ was the first garment the Lord put on; in 61.10 it was among the garments passed onto the Anointed One, who, returning from treading the winepress of wrath, ‘speaks in righteousness’ (63.1). What do we know of the ‘deadly holiness of God’? Is this some heretical teaching; some sadistic description given by an armchair theologian who has been locked in his study far too long, removed from the real world? Or have we been so devoid of the Biblical view that we cannot even recognize the God who “will execute judgment upon all men, and many will be those slain by the LORD” as being God? We have failed to see God as the Scriptures have revealed Him. We have thus been reduced to a casual understanding of the Gospel, and the fear of the Lord is foreign to our common Christian existence. We make light of sin and we are unwilling to give a place to the consideration of God’s dealings with Israel and the Church. I realize that this subject is vast and fraught with all kinds of perils and misunderstandings, but the fact that many believers have been satisfied to consider the modern establishment of Israel as the final fulfillment of the prophetic Scriptures regarding the Jewish return to the Land is a disclosure of how hollow our understanding of God is. We are not eager for truth, nor jealous for His glory, so we jump at any apparent fulfillment because the thought of apocalyptic judgement is just too difficult to bear. We need to see that the burden and vision shattered the prophets themselves. One OT scholar has called the prophets “tragic figures,” for they had peered into a burning bush that popular Christendom has been unwilling to look upon; namely, the future “distress” of Jacob- a time of tribulation “like no other” that he will be saved out of. The prophets were weeping men, praying men, voices in the wilderness, and we have sought to dilute and silence their cries. But our prophetic calling as God’s people in these last days will not afford us that deceptive luxury. I am not encouraging some kind of fatalism regarding Israel, and this is certainly not an anti-Semitic or supercessionist rant. I am not raising questions regarding what is modern and political, but what is eternal and Biblical. The lens through which we view Israel has been more patriotic than prophetic, and our perceptions have been formed much more through media and popular Christian thought than through a true and prayerful perusal of the Scriptures. We are eager for convenience much more than we are jealous for truth. What can be said of the Church, who is called to be the “pillar and ground of truth” but has failed to obtain a jealousy for truth in Her inmost parts? On the other side of the ditch is the ever-rising tide of replacement theologies of various brands. They are gaining great ground in our day, and they need to be challenged by a church that has been given to prayer and to the Scriptures. Mere nationalism, and the heresy of supercessionism, are both a deviation from the prophetic testimony, and this is much more of a theological crisis than we realize. These questions needs to be put before the Lord, for He is the One who has spoken through “His holy servants the prophets.” The subject of Israel and her future is not a modern fad or a fringe interpretation of something barely addressed in Scripture. It is a central issue of the faith, and it has to do with the Lord’s eternal purpose. It is right to rejoice in the reality of Israel’s present salvation (as Jewish souls come to faith one by one around the world), and to anticipate their future salvation (when a “nation” will be “born in a day” at the end of this age), but not without understanding that the final salvific reality will not be established until a staggering time of purging and sifting has occurred, just as the prophets have declared (Am. 9.8-15, Jer. 30.3-10, Dan. 12.1, Zech. 13.8-14.9, Matt. 24.21). Are we expecting this? Have we taken time to pour over the Scriptures in this light, or is our theological box already sealed and unwilling to make room for this kind of consideration, painful though it may be? Who is the God of the Scriptures, what is His true heart with regard to the issue of Israel, and are we truly in alignment with Him along these lines? Isaiah 66, like hundreds of other passages, is a statement of a time to come. We are too quick to celebrate the present State in a presumptuous manner without considering all that the Scriptures have declared with regard to the end of this age and Israel’s experience within it. We need to recognize that the preservation of Israel as a people, and the modern return of Jews to the Land is a remarkable testimony to the faithfulness of God. He will keep His covenant engagements, and He is continuing to pave the way for the salvation of His remnant. But that glorious salvation of “all Israel” will not be finished before the great trouble comes. It is much easier to spiritualize or make mystical these kinds of passages for it relieves us from a sense of responsibility to the Jew in the present and gives God’s last days dealings with Israel an ambiguity that comforts us in our indifference. Our present salary and future retirement mean more to us than our formation in Christ and our witness to Jew and Gentile, for we haven’t heeded the prophets with regard to the issue of Israel. We are happy to build our savings accounts, prepare for retirement, or fashion our all-too American ministries to the neglect of our responsibility to the Jew. We are free to disregard, neglect, and dismiss any consideration of our responsibility to him in the trials that are on the not-too-distant horizon, for whether we spiritualize the passage away or treat them as already fulfilled, we are off the hook. But the prophets, in keeping with their calling, do not share in our pipe-dream. Our calling is not primarily with supporting every decision that modern Israel makes, but with befriending and preaching the Gospel to the Jew, contending in prayer for the salvation of the people, and preparing for a time of great distress, whereby the Church will be called to stand with the Jew, even to the point of death, that the remnant might be saved. This is the Church’s eschatological destiny: to be a “Corrie Ten-Boom” type corporate witness to the people of Israel in a time when the nations are raging against the Lord’s “holy covenant” and against His chosen people. When the Lord meets with them “face to face in the wilderness of the nations” it will primarily be through His Body. It will require more than a sentimental affinity for Israel. It will require a people living on the basis of resurrection life- a people of prayer, a people of authentic love, a people of the Book, a people who have mercifully identified with Israel, even in her unbelieving state. A people who know by revelation that because of His choosing, they are ‘set apart’ before they are holy, manifestly speaking. It is by our extension of mercy that they shall obtain mercy, and there will be great loss in this life for those who extend that mercy. But the King is coming soon, His reward is with Him, and He is worthy of it all. We need to ask if any of our theological/eschatological conclusions been formed on the basis of self-preservation. There is too much at stake for the church to be bound by myopic views when it comes to the issue of Israel, as with all of the glorious mysteries of the faith. ….return [to the land] in an unconverted state. If they had returned to their own land in a converted state, it is impossible that God would pour out upon them His wrath. It is in Judea that, according to the prophet Zechariah, the Spirit shall be poured out upon the nation, and their hearts be turned unto the Redeemer (Zech. xii.). A second restoration is spoken of in Isaiah 11.11, 12, 15, 16 and 66.19, 20. ….There are thus two restorations- one before, the other after the great crisis; one partial, the other complete; one which provokes the enmity of the nations, the other in which the nations rejoice and even co-operate. Saphir clearly anticipated a “partial” return to the land (which we believe began about 120 years ago with the modern Aliyah/Zionist Movement), which would set the context for the wrath of God to be poured out upon “all the sinners of My people.” The establishment of the modern State of Israel, and its subsequent devastation, will precede the national conversion and salvation of Israel at the “day of the Lord.” The whole nation, after being shaken as in a sieve and seeing glimpses of its Messiah and King through a mostly Gentile Church in the nations (Ez. 20.32-37), will look upon the pierced One with great mourning, and be saved (Zech. 12.10-14). They shall return to the Land in an ultimate way ( Isa 49:22; Isa 60:9; 66:20; Zech 8:23). The Lord Himself shall “plant His feet on the Mount of Olives,” and “mourning and sighing shall flee away.” In that day, they shall never be uprooted again, and the mercy and righteousness of God will be their fountain. The “everlasting covenant” will have its ultimate fulfillment. The future death and resurrection of Israel provides the most poignant eschatological reiteration of the cross of Jesus Christ. It will be a statement to the nations of the reality that life issues out of death when the Lord is its Author, and the nations shall for the first time behold a national witness in the earth; namely, the redeemed of the Lord, Israel, His beloved nation. If we stumble over the necessity for death and resurrection, we need to ask the question of how we were saved? Did we come into the experience of new life without experiencing death? What do we expect for Israel? That somehow they would be saved and made into priests by the power of human government? That they would progressively improve without first coming to terms with the One who has a covenant controversy with them? We are Christians by profession and secular humanists by our truest feelings, and we need to be delivered from that condition if ever we would be to Israel what the Lord has desired us to be. The Church is called more than ever to give Herself on behalf of Israel. Not from a mere political allegiance; a naive desire to spread Democracy in the Middle East; nor out of a sentimental attachment to relics or locations in the Land. It is from a merciful identification with His people, in recognition of the holy covenant, through intercession and witness both now and in the “time of trouble,” when the nations will rage against them. It is with a singular and unwavering desire for their salvation, fasting and praying for laborers to be raised up as effectual witnesses both now, and during the time of great “tribulation” to come. And chiefly, it is with a radical jealousy for the glory of God in the earth. Any coming of the Lord related to “actions…. and imaginations” must be a coming in judgment. Consequently, the “glory” referred to would be that of the Judge. The reference to “glory” in verse 18, however, leads to the gathering of the world into Jerusalem as an accepted people. It must be, therefore, that “actions” and “imaginations” refer to what has preceded; just as “glory” refers to what follows. God will come “with fire” because He will not change who He is, and His judgments are ultimately His mercies. He is the same yesterday, today, and forever. If we are offended at His dealings we have yet to know Him adequately. It is for this reason that the Lord has given us the Scriptures. Israel’s future, and the nature of God’s dealings, are not unlike that which has already been recorded in the Scriptures. We need to understand that this is who God is, and He does not change. Go back to the Scriptures, dear saints. Do not interpret the issue of Israel by watching popular Christian TV or listening to the media on either side. Go to the Scriptures. Go to the place of prayer. Do not swallow another man’s theology without giving yourself to a “Berean” kind of searching. Open the Scriptures yourself and ask the Lord for a greater revelation of Himself. Thank you for this timely word. Hi Bryan, very challenged and at the same time very thankful for this word. This resonates at a very deep level, as have the words of Art Katz and (almost 30 years ago) Gary Kroese. The things (ideas) you have shared here are not merely “good” theology, but what I truly believe to be the only accurate interpretation of the scriptures regarding the church and Israel. Unfortunately, I’m not quite sure how many you will find who have ears to hear. Of course, that isn’t your job or mine. We are called to proclaim the word of the Lord (the truth) in love, knowing that His word always accomplishes His intended purpose; and I am confident that purpose will not be lost on me if I will humble my heart. Every blessing to you Bryan (and your family) looking forward to you coming to share more with us soon. This is by far the most well rounded view of the issue of the church and Israel, that I have read in my years of being a follower of Yeshua. Thank you for your prophetic testimony, my soul is hungry for this kind of teaching, this is the bread that Jesus spoke of because it is the testimony of His very “body.” I pray for your ministry and will labor with you to see “All Israel” saved in the days to come. It is my utter expectation that the “Jewish question” will be the fundamental “hinge” upon which God separates the “sheep and the goats”, the “wheat and the tares” in these last days. When “darker days” come upon us, only those who truly have the Spirit of Christ within (Col 1:27) will be willing to suffer in the likeness of their Messiah to see the Jew come to faith. Jerusalem is and will be a stumbling block to the nations, but it will also be one to the Gentile church. Just as their is a sovereign blindness upon the eyes of the Jew to the revelation of their true Messiah, their is one that covers the eyes of Christendom to Gods love for Israel and His plan to restore them in the latter days. May we be “trumpets” who stand between Jew and Gentile and point to Yahweh as the only One whose power can create the “One New Man” in the earth. (Eph 2) Bless you in Yeshuas Name my brother! This blog is a MUST READ for the whole of Christendom. Just as there is a sovereign blindness over the Jew to the glory of their Messiah, Jesus the Christ, there is one that covers the eyes of Christendom to Gods love for Israel and His plans to restore them in the latter days. This issue may seem at the surface, merely theological in nature, but it is so much more because of its implications for the church of Jesus Christ. It is my sincerest conviction that the issue of Israel and the Jewish people will be a “hinge” upon which God separates the “wheat and the tares” in the latter days. If our theology is based upon a desire for self preservation and not one for a personal suffering that would lead to the salvation of another, namely the Jew, then we will be utterly useless to the Lord when the final “sifting” of His people Israel and the nations come upon this world. Please read this blog by a dear brother with an open heart and ask God if these things be true. Bryan Anthony speaks of Gods plan to create a “Corrie Ten Boom” witness in the earth to the Jew in the last days Holocaust that is to come. The question is, will you join in on the Calvary road to suffering, in obedience to our Lord, for it is through suffering that one is brought to a revelation of the cross, which leads to an eventual resurrection and glory that far outweighs any pain endured along the way. In Jesus Name. This was one the most interesting and inspiring articles I’ve read in a while. I am sharing it with as many people as I can, you are a man after God’s heart! One of my passions is eschatology and the issue of Israel is muddled at best in modern theology. Thank you for your insight and encouragement…to dig deeper and find the Father’s heart for the end times. You are a man after God’s heart! One of my passions is eschatology and the issue of Israel is muddled at best in modern theology. Thank you for your insight and encouragement…to dig deeper and find the Father’s heart for the end times.